I've recently started using the online DVD rental service Netflix. And I have to say, Netflix is the Chipotle of the internet meaning it's like crack. And slightly spicy also. Anyway since I don't have the time or money to go see all the movies I would like to in theaters (or i wasn't even alive when most of the movies in my queue came out) Netlfix is a good way to play catch-up. My friend Chris was very confused at the fact that my Netflix queue is continually GROWING instead of shrinking. Anyway I am insanely excited for the upcoming Cloverfield/1-18-08/Slusho/Untitled JJ Abrams Project/whatever else you want to call it film. It's basically going to be a creature feature a la Godzilla, but with a budget. Many people believe that Cloverfield was inspired by a recent creature feature out of Korea entitled "The Host" Now I had been hearing about The Host for a while now and it was all positive stuff so I decided to check it out because I'd like to see the movie that inspired the craftiest man on the planet to produce a film in a similar vein and I haven't seen a good monster movie in I don't know how long. That being said, I begin my review and I have to say, The Host blew me away. Seriously I was expecting a good old-fashioned creature feature and that's what I got, but there is also SO much more going on with this film than a big monster terrorizing a poor town. 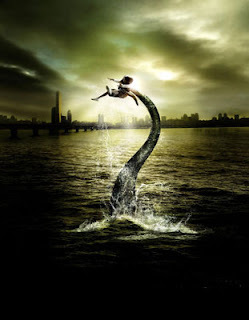 The film follows a family who loses a little girl to the monster and think she has been eaten until her father recieves a phone call late at night from the desperate girl saying that she has been captured by the creature and taken to a large sewer. The family then goes all Little Miss Sunshine on the hospital they are in and set off to find the little girl. It's a fairly simple set-up, but the dialog and acting bring the film to a new level. You connect with the characters and their plight, and the script is often hilarious. But The Host runs the gamut of emotions, it's funny, sad, deep, brilliant, and most important in a monster movie terrifying. I don't dig on horror flicks that much mainly because they're all shock value and no real terror."BOO!" only lasts a few minutes at most. "WHAT THE FREAK IS GOING TO HAPPEN?!" when done right lasts days after you've seen the film. The creature isn't very large, but he's definetly not natural and he's hungry. It shows up fairly early into the film and I wasn't sure how I had felt about that, but as the movie progressed it didn't bother me as much because the thing was still scary as hell and not in the "ooga booga" sense, but in the sense that this thing was unpredictable, it moved erratically and you couldn't predict it's next move. And THAT is horrifying, you don't know what you're up against even though you've seen it, you can't figure it out. The Host filled me with a sense of dread that only few films I've seen have done. The Host is downright freaky, but doesn't prey on the viewer, it's hard to describe, but it's effective. This is the best monster movie I have ever seen and I am kind of worried about 1-18-08 because I love me some JJ Abrams, but I dunno if even he can pull off a good American creature feature, I lost faith in that after the 1998 Godzilla disappointed fanboys all over the country. So for a really good time with a different sort of feel in the creature feature subgenre check out The Host.